If you have read one of my first postings (CMMI first post ) you know I have been looking for the right tools for the job up till now. It seems the search is almost over and I have found a solution that will require little or no programming effort and will allow to achieve the goals set forth in the earlier posting. The solution I have in mind combines the latest Office technology from Microsoft to deliver flexible and easy to use system. Word and Excel are going to be used as report/result presentation tools. So far I had elaborated initial vision of the solution and only high level architecture. 2. 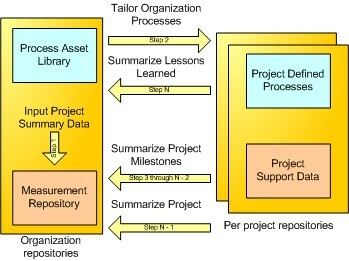 Project Measurement Repository – this will hold the measurements we collect. Well this is what I am working on now. Once I make the complete solution from technology and requirements I will post more details. I am also going to look at what the MS Team system is like as it may be just too similar to what I am doing. I am a bit afraid that it is going to be too much Microsoft Centric and integrated with Visual Studio, which of course is not good for .Net free projects.